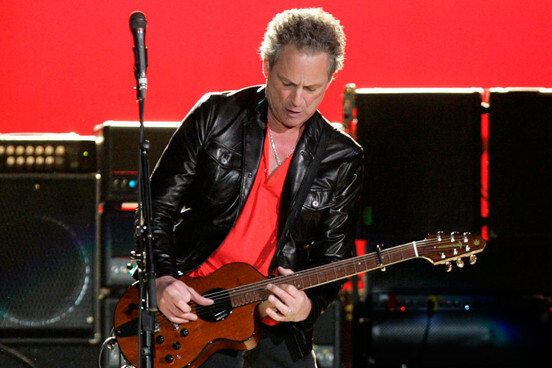 Lindsey Buckingham has admitted that he "would love" to record a new Fleetwood Mac album. Earlier this month, the iconic band ended months of speculation by confirming that they would embark on a reunion tour next April, while singer Stevie Nicks also hinted that they could return to the studio. Now, in an interview with Rolling Stone, Buckingham said that he was keen to work new material with his old bandmates – although he did add that any recording plans were currently on the "back burner". Asked if he was interested in recording a new studio album, he replied: "Absolutely, absolutely I would. In fact, about six, seven months ago, John [McVie] and Mick [Fleetwood] were over here and we actually cut some tracks, and we did enough for maybe half an album. "But you gotta get Stevie on board with that, and at the time, she was really quite caught up in what she was doing," he added. "But I would love to do that because John and Mick were playing their asses off." Talking about next year's reunion shows, meanwhile, he said: "The last eight or nine years, I've had a lot of growth. I sort of caught up on the need to explore the more esoteric side of the palette. Fleetwood Mac is gonna start rehearsing probably the beginning of February and I'm actually looking forward to it. I miss those guys." Fleetwood Mac are one of a number of names rumoured to be headlining Glastonbury when the festival returns. Speaking to NME about the rumours, festival organiser Emily Eavis said: "I think Fleetwood Mac would be amazing to get, I'll be totally honest we haven't had any conversations with them yet but, you know, it is still early days. We're just talking to some headliners now. For us it's about getting the balance of heritage bands, legends and new bands – just keeping that balance."